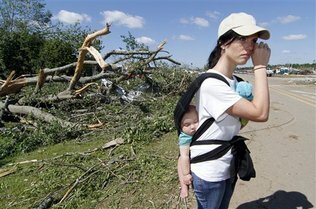 At least one of the massive tornadoes that killed hundreds across the South this week was a devastating EF-5 storm, according to an analysis Friday by the National Weather Service, which suspects several others also were the worst of the worst. After the first day of assessing storm damage, the weather service said the tornado that hit Smithville, Miss., at 3:44 p.m. EDT on Wednesday was an EF-5 storm. That’s the highest rating given to assess a tornado’s wind speed, and is based in part on damage caused by the storm. The weather service said the half-mile wide Smithville tornado had peak winds of 205 mph and was on the ground for close to three miles, killing 14 and injuring 40. It was the first EF-5 tornado to strike Mississippi since 1966, and the first EF-5 tornado in the United States since a May 25, 2008, storm in Parkersburg, Iowa. Meteorologist Jim LaDue at the weather service’s Storm Prediction Center in Norman, Okla., said he expects “many more” of the tornadoes that killed at least 297 people during Wednesday’s brutal outbreak of severe weather will be rated EF-5. The weather service also is sending assessment teams back out to review more damage in several states, including Mississippi and Alabama. The assessments are preliminary, and are based on photos taken during the ground surveys and consultation with experts. They will be confirmed later this year. Meteorologist Mary Keiser at the weather service’s Birmingham office said the tornado that tore across Bibb, Greene and Hale counties in northern Alabama was given a preliminary EF-3 rating, which has winds of 136 to 165 mph. At least seven people were killed and 50 were injured. According to surveys, the tornado was an EF-1 when it touched down in southwest Greene County near the Tombigbee River just west of Tishabee. It intensified into an EF-2 as it moved north of Forkland and across the Black Warrior River into Sawyerville and the Talladega National Forest in Hale County, where six fatalities and 40 injuries occurred. It became an EF-3 northeast of Sawyerville and continued to track into Bibb County, where one person was killed and eight were hurt, according to the weather service. Surveys on the twisters that hit Hackelburg, Shottsville and Haileyville in Alabama were said to be of EF-3 strength or potentially higher. The surveys are being further evaluated, the weather service said. Keiser said it will take time for meteorologists to complete damage assessment.”This is very rare, historic damage so we want to make sure it’s accurate,” she said. The Smithville tornado rated EF-5 destroyed 18 homes, which the weather service said were well built, less than 10 years old and bolted to their foundation. The plumbing systems and appliances in the worst part of the storm’s damage path were either shredded or missing entirely, as is a 1965 Chevrolet pickup truck that was parked in front of one of the destroyed homes.